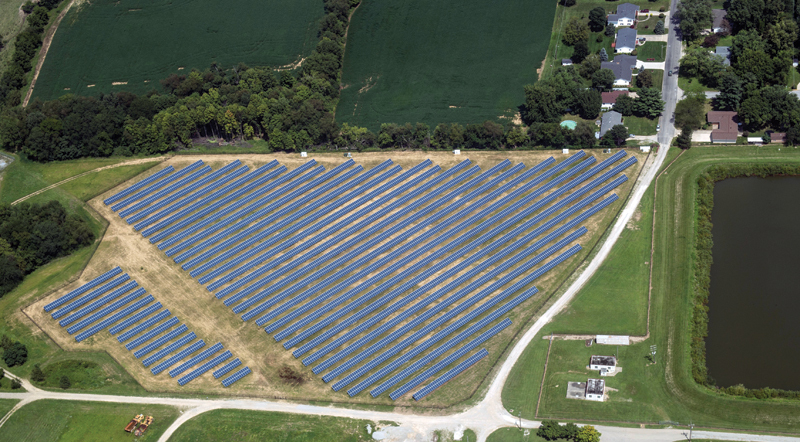 The installation of a 2.1 MW solar project at Cedarville University in Ohio was an education in how to deal with bad weather—but everyone working on the project pulled together, and the Cedarville solar array is now producing more power than it was modeled for. In a perfect world, large-scale solar projects would be installed during the dry seasons of the year. In the real world, though, developers can't be that picky. 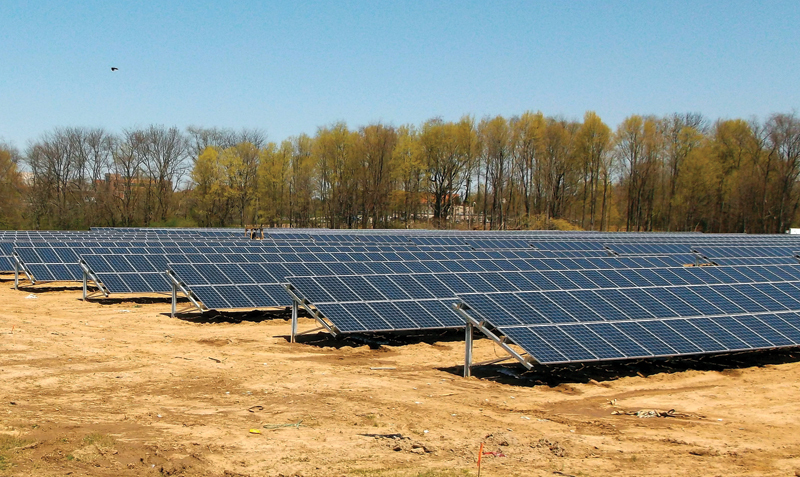 So when the weather threw a curveball during the 2013 springtime installation of the 2.1 megawatt Cedarville University solar project, contractors and subcontractors worked together to face the rain and mud—and complete it on time. "It was a team effort to help each other out with the mud," said Colin Derhammer, a senior engineer and project manager for Milford, Ohio-based Melink Corp., the project developer. "Everybody pulled together, and we were able to stay on schedule." Cedarville University is a 125-year-old Baptist school with more than 3,400 undergraduate, graduate, and online students in Cedarville, Ohio. It offers more than 100 different areas of study, including engineering, pharmacy, nursing, and business. Rod Johnson, associate vice-president of operations, said he and the university were initially looking for a system that could provide power should the campus experience a widespread power outage. A dry hurricane had blown through the area a few years ago and knocked out power in some parts of the region. Although the campus escaped the outages, losing power would be a major problem since the university is primarily a residential campus. Unfortunately, Johnson said, the technology was cost-prohibitive at the time. Jeremy Chapman, business development manager for Melink Corporation's solar division, said he approached Johnson, other university representatives, and former Cedarville mayor Jim Phipps in mid-2011 about partnering on a solar project. Johnson said such a project was enticing because it offered several benefits. The project was forecast to be budget-neutral for the first 10 years, after which the university has a buyout option. The project could also yield good publicity for the university, since it would be the largest solar array directly connected to a college or university in Ohio. It also would be one of the top 10 largest solar arrays at any four-year university campus in the United States. In addition, the project would mesh nicely with the university's existing curriculum and long history of involvement with solar energy, Johnson said. The engineering program and faculty are currently working on ways to incorporate the solar array into lessons, using it as a laboratory. Ironically, a couple years before the university embarked on the project, a team was given an assignment to develop the requirements for a two-megawatt PV system. Their results, including size and power produced, were nearly identical to the proposal Cedarville received from Melink, Johnson said. Cedarville University was able to purchase 11 acres of undeveloped land near the campus from the village of Cedarville. The institution entered into a power purchase agreement (PPA) where the university would lease the 11 acres to Melink for 25 years. Melink would own the solar project and be responsible for maintenance. The university agreed to purchase all of the energy produced at a fixed price for 20 years and then at market rates after that, Johnson said. There is a buyout option at the end of 10 years at fair market value, which the university expects to exercise, he said. A PPA was also advantageous since as a nonprofit, the university wasn't eligible for any tax credits from the project, Johnson said. Securing the necessary building permits wasn't difficult, Derhammer said. Where they encountered challenges was obtaining an easement through private property so the PV project could be connected to the university campus. Melink had to contact the property owner as well as the lender. The mortgage had been bought and sold three times, so tracking down which institution actually held the loan took some digging. "We wanted to make sure we would not be kicked off the property by the lender," Chapman said. "Other than that, I think the school and the town of Cedarville worked closely—and that definitely helped," Derhammer said. The project is at 39 degrees latitude, and Derhammer said a 25-degree fixed tilt for the panels balanced costs with energy production. "We want to make sure the system is producing as much as it can," he said. "But we also want to keep costs in check." The rolling terrain on which the project sits has a slight slope to the north. "In order to minimize impact on the site and keep grading costs from skyrocketing, there is a gentle northward slope that is obviously not ideal," Derhammer said. "After adjusting row spacing and juggling all the other factors, I believe we were able to find the best solution." The goal is also to have solid production throughout the year. As he sized up the project, Derhammer said they were constrained by the 11-acre size of the land. In addition, he had to design around an easement for underground pipes from a wastewater treatment plant that ran under the solar project to the campus. The system, which sits behind the university's meter to directly power the campus, will provide Cedarville University with about 10 percent of its annual energy needs. If the university had chosen to feed excess into the grid, officials would have had to enter into a contract with Dayton Power & Light, the local power company. But the PPA between Melink and Cedarville proved more advantageous to both parties, Derhammer said. Southern Ohio is on the fringe of a region that doesn't get a lot of frost during the winter. If you have to install a project in northern Ohio, the ground will most likely be hardened by cold temperatures. But in southern Ohio, winter typically involves rain, and last winter had more than normal, Derhammer said. Grading began in January. Coupled with a soggy winter, project officials were left with a "soupy mess," he said. Melink went with racking from Cincinnati, Ohio-based RBI Solar for the project because of its robustness, Derhammer said. "RBI's quality and service have kept Melink returning for multiple projects," he said. When it came to driving posts for racking, Jeff Cooley, RBI project manager, said they had difficulties compacting the soil because of the mud. Unlike some racking systems that have posts on each end, the RBI system is based on continuous rows. "We basically use the second post as the first post for the next bays," Cooley said. That means if a row has 30 bays, it will have 31 posts, not 60 posts like some other racking systems. Because each post has to support additional weight, it has to be larger in diameter and driven deeper into the ground. In many areas without high wind loads, posts for other systems typically are driven six to seven feet deep, Cooley said. In the case of Cedarville, the posts were driven seven to eight feet deep. In a few places, the posts were driven nine to ten feet, which was consistent with the geology, he said. "We drove our posts to pull tests to determine if they had the capacity to support the racking," Cooley said. "Because we had constructed this project in the winter and there was a lot of loose soil, some of the posts did fail the pull test." In those cases, RBI went with dual posts instead of a single one. "We basically fought the mud—it wasn't fun," Cooley said. "Dual posts had to be done in certain areas. Also, everything took longer, and you were getting equipment stuck. Melink did bring in some gravel, and that helped a bit. "We basically had to increase equipment and manpower because everything just took longer to get done." Melink went with 245-watt panels from REC Solar Inc. of San Luis Obispo, California, because of their production, high quality, and bankability, Derhammer said. Altogether, 8,792 PV modules were involved. The modules were wired into 29 combiner boxes that tied into four inverters from Solectria Renewables of Lawrence, Massachusetts. Derhammer said they like Solectria because it is an American company that builds a quality inverter and provides good service. The four inverters were then tied into two transformers that stepped up the voltage to 12,470 volts, which was fed into Cedarville University's medium-voltage electric loop. Through careful scheduling, deliveries were staggered and essentially created a just-in-time set-up. One small challenge involved giving directions to the drivers. "The array field had no physical address so the trickiest part was getting deliveries to 'the big open field at the end of the street,'" Derhammer said. TMI Electrical Solutions, which had worked with Melink on other projects, was the general contractor that also provided electrical services. The solar project went on line in April and is producing more than what was modeled. "We try to be as conservative as possible in our financial models by incorporating production estimates that have a high probability of success," Chapman said. Derhammer agreed. 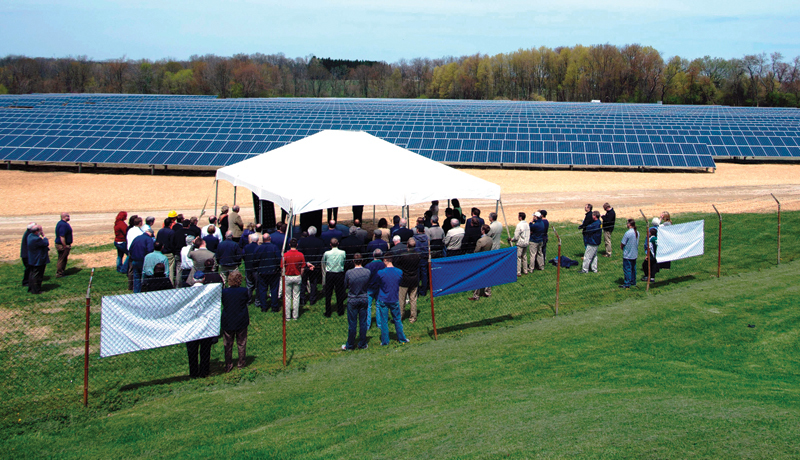 "Our entire portfolio of solar assets is producing just over what we have modeled. Melink is certainly conservative. We never want to over-promise. We're walking a fine line between accuracy and limiting risk for our partners."